So, if one is said to possess character by doing virtuous actions, does the idea of doing an action without the inward inclination imply hypocrisy? Take as an example that you are wrongly maligned at work. Everything inside you urges you to be defensive and snarky. Are you rightly considered just when you hold your tongue and respond politely? “Let us name and shame, as being totally inadequate, the idea that if something is done spontaneously it carries an automatic validation, whereas if something is done through obeying orders, or after careful reflection, or despite enormous amounts of pressure of various kinds to do something else, it is somehow less valuable, or even ‘hypocritical’ because you weren’t really ‘being true to yourself’”. As he goes on to say later, genuine artistic inspiration requires perspiration. So to say that working on your temper makes you a bit hypocritical because it didn’t come naturally, would be akin to criticizing Lewis for having to write and rewrite his work for the purpose of honing and sharpening it! At the great risk of oversimplifying what Paul has said on this subject, we cannot overemphasize the importance that the renewing of our minds plays into this daily habit-forming transformation. “Do not be conformed to this world,” he explains, “but be transformed by the renewing of your mind, that by testing you may discern what is the will of God, what is good and acceptable and perfect.” This line of thinking runs through much of Paul’s writing. Remember from Romans 1 that mankind has incurred God’s judgment because “they became futile in their thinking, and their foolish hearts were darkened.” Paul saw that the Christian heart and mind must be renewed by the daily, patient working and walking with the Spirit in light of how God has revealed Himself in Scripture. The Holy Bible, English Standard Version, (Wheaton: Crossway, 2002) Romans 12:2. See also Eph. 4:13-16; Phil. 1:9-11. Ibid. Romans 1:21 See also, Eph. 4:17-19. Hey!!! 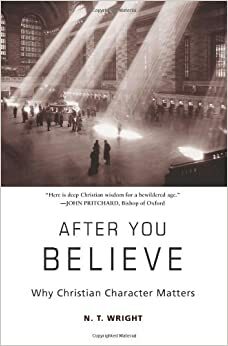 I’m reading After You Believe!!!!!! I am just now reading this post to your blog, but I started reading it a few days ago! Took your advice, and I’ve been able to read at least 20 minutes everyday! Excellent, Sarah! Glad to hear that. I hope you enjoy it.